Jason Momoa, who you’ll recognise as Khal Drogo from Game of Thrones, wears a bushy beard and full moustache in this picture. The hair is tapered towards the front creating a triangle shape and he’s totally rocking the salt and pepper look! No longer just for mountain men, the long, full beard is right on trend in 2016. 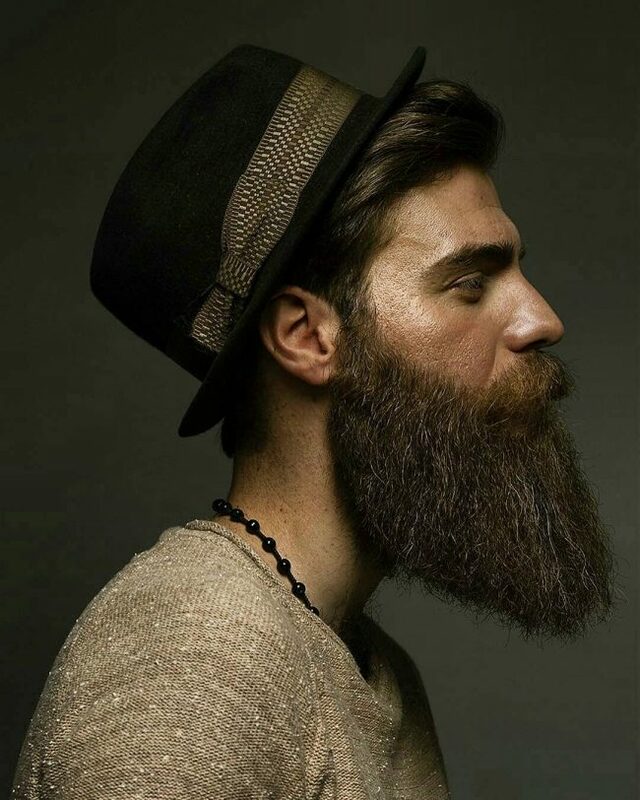 This beard completely conceals his jawline and chin and has been clipped to have a shape while still looking natural. He’s paired it with a long handlebar moustache, which has been twisted at the ends. In this full moustache and beard look, the hair along the moustache has been trimmed short so as to just hug the lip. The beard is thick and covers the lower jaw and chin entirely and has been clipped into an A-line shape. Here the beard is more rugged after being grown out; a natural look. The moustache is also full, but unlike the beard, it has been kept clipped. As an extra detail, we can also see that a few small braids have been added. In this picture, we see Jason Momoa with a longer beard. This time, the beard has been collected and tied into a beard ponytail. He’s sporting a full beard, with growth on the sideburns, chin, cheeks and moustache, however, the moustache is trimmed to just above the lip. A beard can look untidy when it is allowed to grow unchecked. 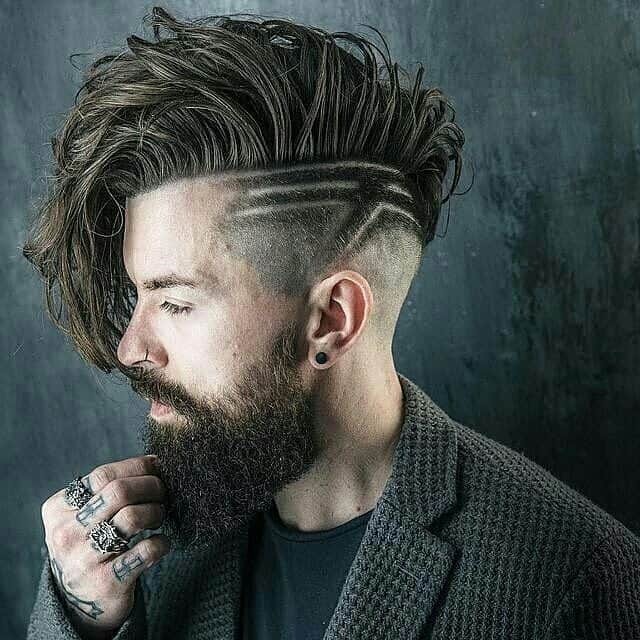 Here we see an example of excellent beard grooming – keeping the hair in a neat shape and creating shaved lines on the face. In this picture the moustache is a little longer, just brushing over the top lip. It’s important to look after the hair in your beard by using the right products to keep it conditioned. 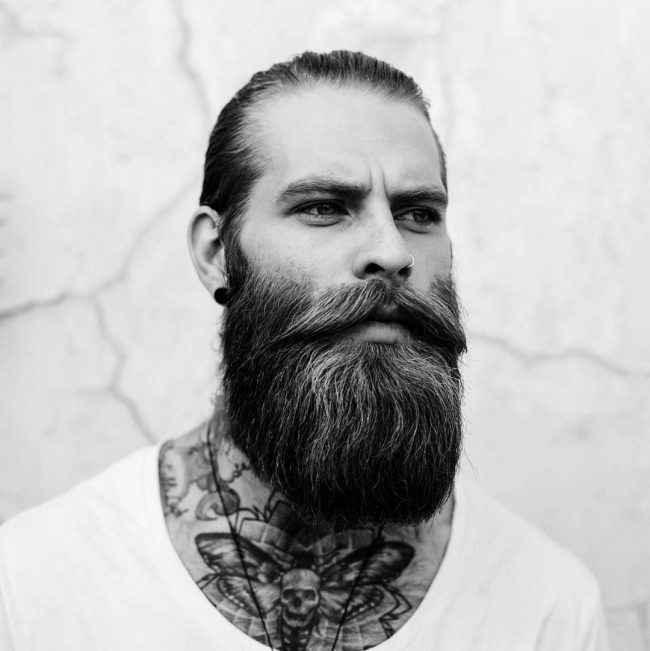 This full beard is clearly well maintained and has been shaped to keep its natural form. There is a handlebar moustache as well, that has been combed into the beard. To enhance this epic beard this man has kept the hair on his head lighter and gelled down. A full and moustache has been grown and while the moustache has been kept short the beard has been grown quite long and is seen here secured in a plait. 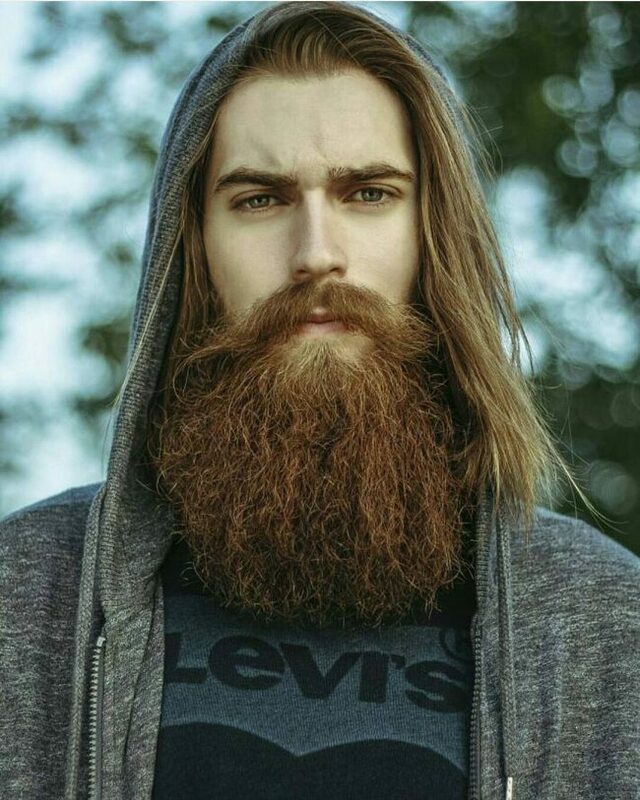 In this picture his long full beard has been secured right at the end with a piece of elastic, bringing the hair together in a pleasing shape. Notice how soft and shiny his beard is; obviously very well cared for. 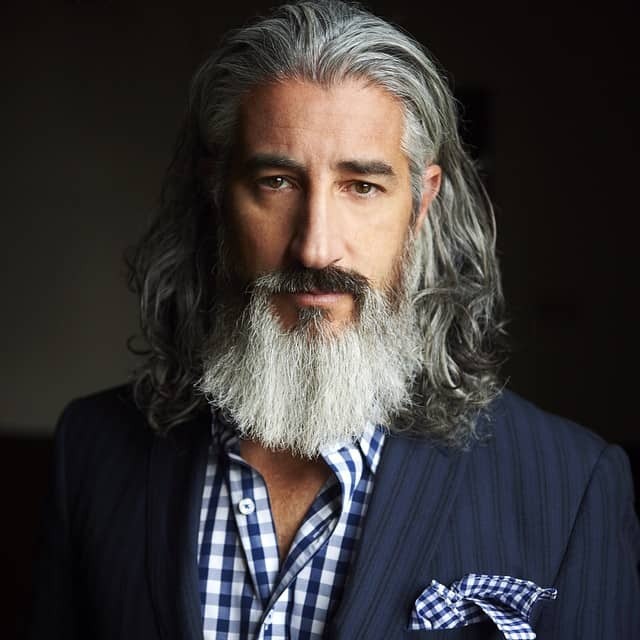 In this picture, the beard completely covers the lower portion of the face and has been trimmed into a squared off shape. 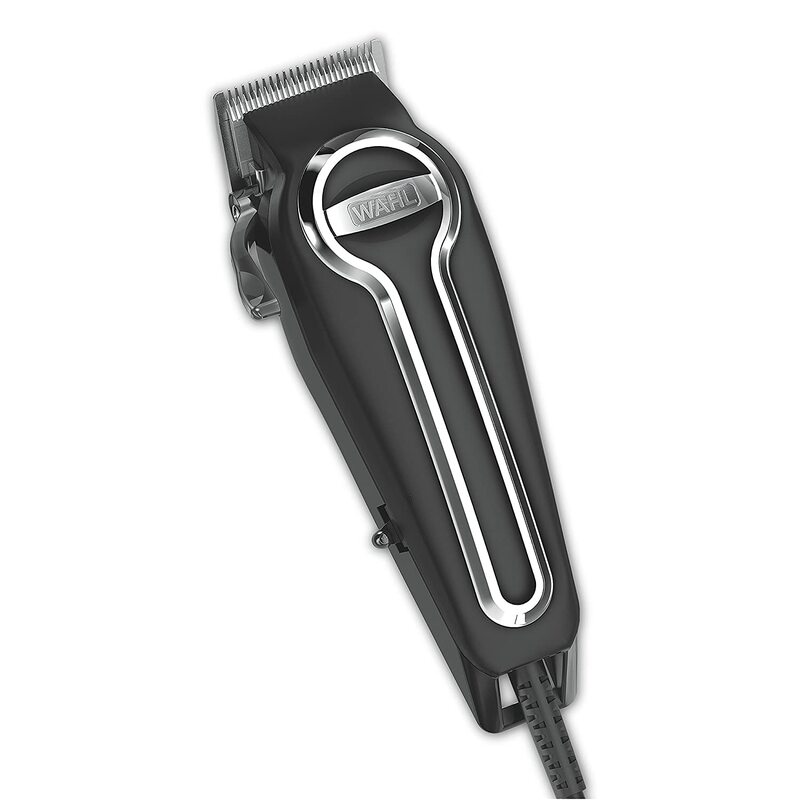 The moustache is long and has been divided into two sections and twisted outwards to create interest. Here the beard has been kept in a natural shape and brushed out to fall straight down. 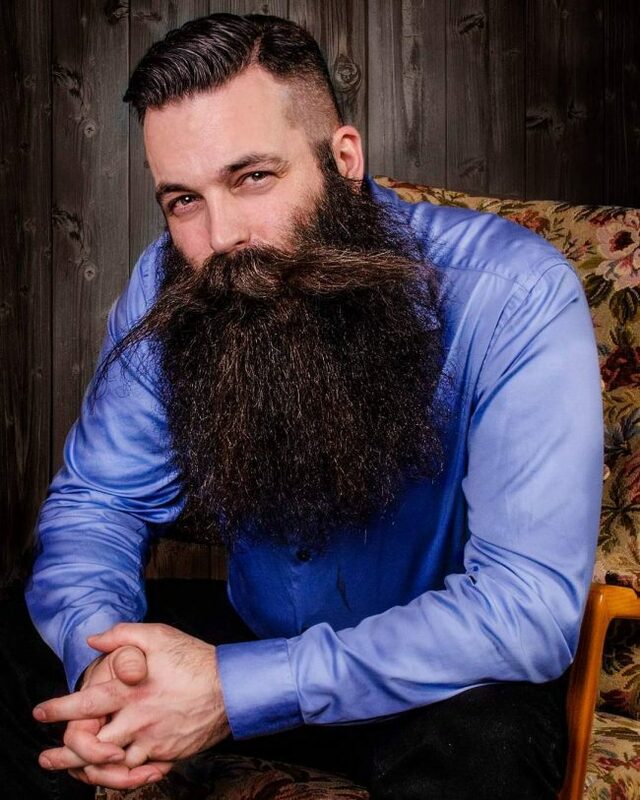 The moustache is long as well and has been combed into the beard. Wow, what a red! Here we see a full beard that has been trimmed into a rounded shape at the bottom. Notice how the hair from the soul patch has grown out a lighter shade? The moustache has been brushed to the sides but still almost covers the lips. Clean straight lines on beards are very trendy, just like the beard featured here that has been squared off to have a pushing forward feeling. 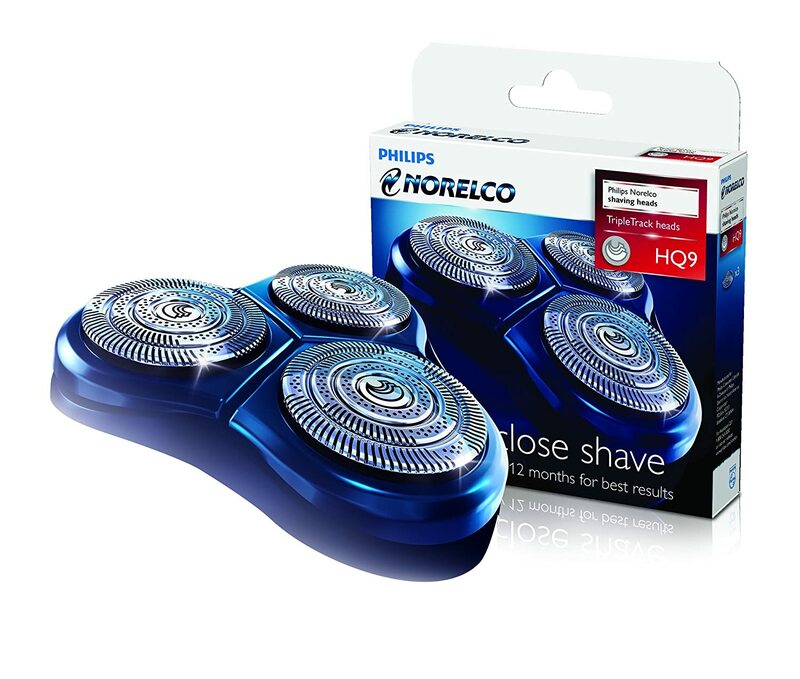 In this picture, we see that the some of the neck hair has been shaved to keep the beard in a rounded shape across the contours of the face. Here we can see that the moustache has only been grown long from the sides of the mouth, leaving the mouth open. The rest of the beard has been shaped to have a natural feel. 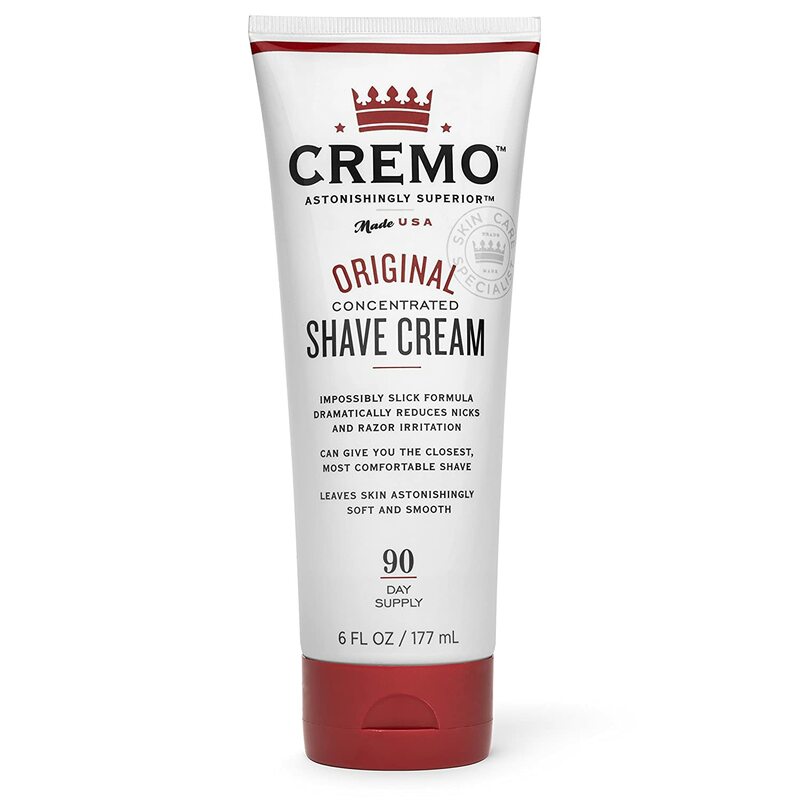 This beard has an unusual texture that has been created by crimping the beard to form waves. His long beard hair looks quite well conditioned, which has made this look possible. 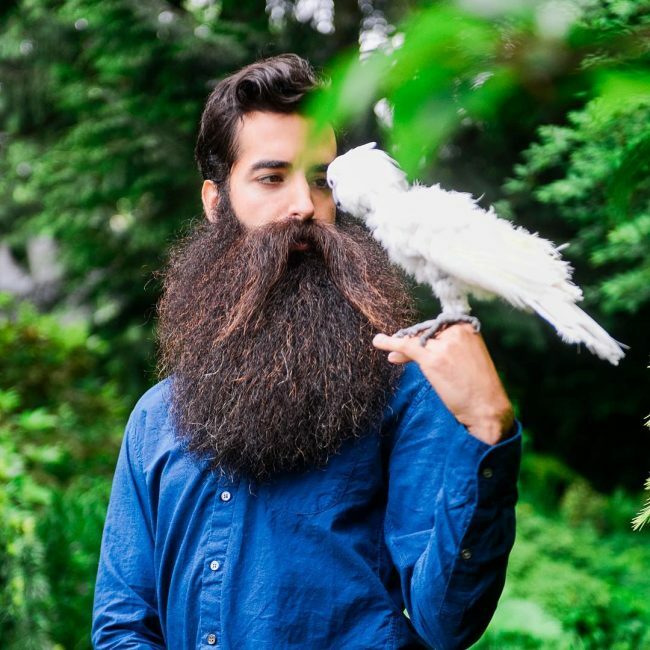 This beard has a great curly texture and manages to look wild while still being manicured – very handsome! Here the beard has been grown full and long and then snipped to match the shape of his face. His white beard has a refined gentleman look and he’s teamed it with a darker moustache. 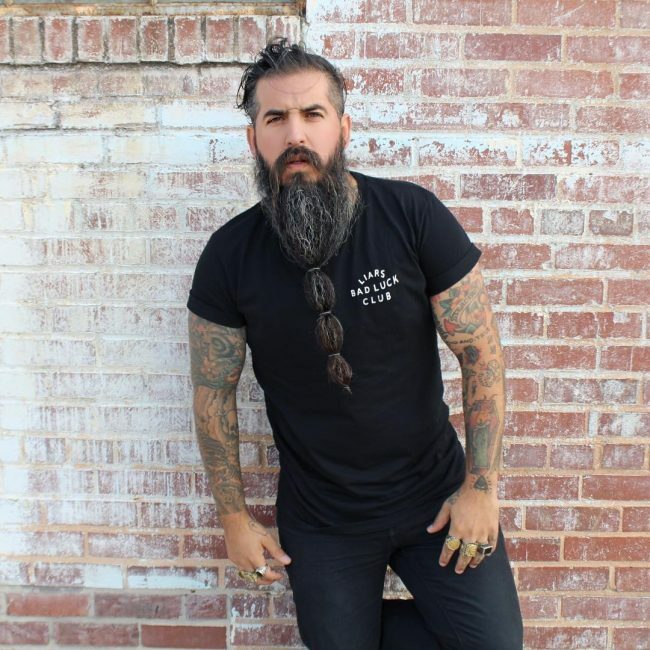 This beautifully hued beard has been grown to chest length and the moustache is long as well, but has been brushed into the beard to open the lips. The well-established moustache dominates this look. It’s been parted slightly and styled into tips; set against a full beard. 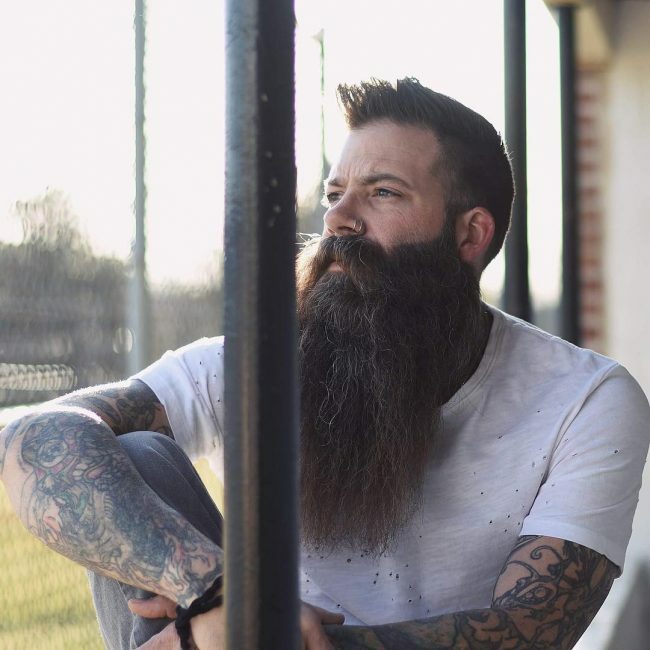 Long beard styles are suave and fashionable; particularly the full beard style where the hair grows long from the sideburns, chin, cheeks and upper lip. Long moustaches are also popular and can be worn over or above the lips. Whatever your hair colour there’s never been a better time to let your beard grow out long and free! 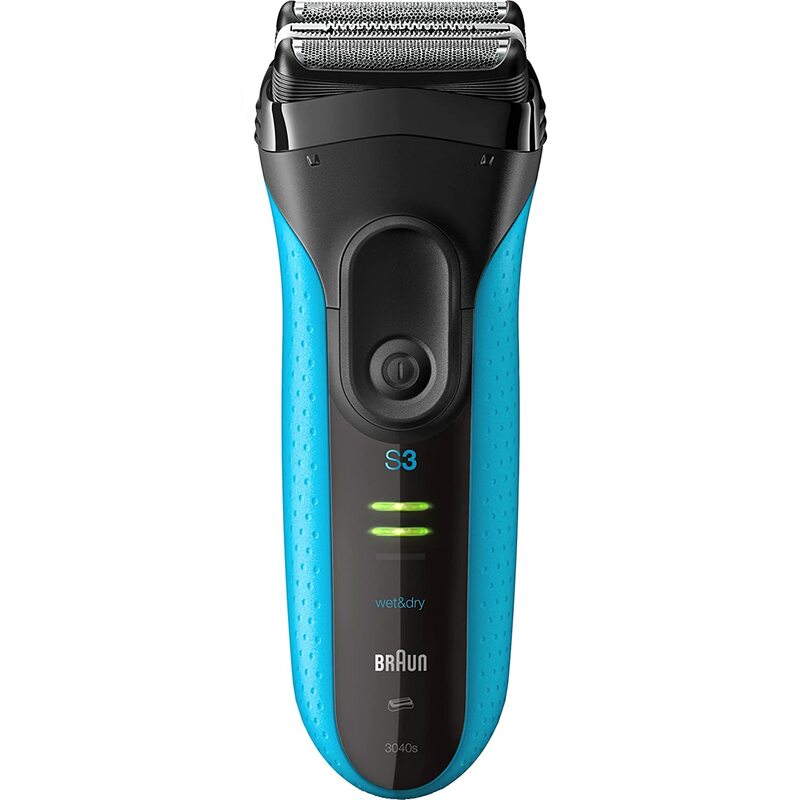 Use these beard trimmer to get stylish and clean beard style" " see these reviews of 10 best beard trimmer on 10hightech.